YellowAirplane.com: MiG-15 Fagot, Russian Military Jet Fighter Aircraft Models, Diecast and Plastic Model Kits. MiG-15 Fagot Russian Military Jet Fighter Aircraft Models, Diecast and Plastic Model Kits. 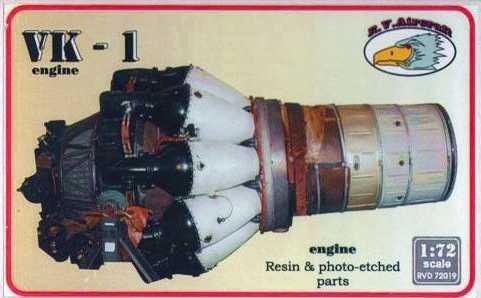 Russian Fighter Jets Model Department. Aircraft Models, Diecast Models, Plastic Model Kits. The MiG-15 was one of the first successful swept-wing jet fighters, and it achieved fame in the skies over Korea, where early in the war, it outclassed all enemy fighters. The MIG 15 is believed to have been one of the most numerous jet aircraft ever made, with over 12,000 built, with a possible further 6,000 being built under license outside the Soviet Union. First seen on November 30, 1950 during a raid on the North Korean Air Base, when an American B-29 Superfortress was hit and damaged by cannon fire from an aircraft that flashed by so fast, the gunners had no chance to return fire. The "Mikoyan OKB", was founded in 1939 on Leningradskiy Shassi (highway) with a series of buildings and a small factory for use in building aircraft prototypes. The OKB was at first, as the title implies, strictly an R&D facility that built prototypes. The Mikoyan, ( MiG ) flight test center is located at Zhukovskiy (called Ramenskoye, or abbreviated "RAM" by western intelligence and used in the intelligence designation of new aircraft such as "RAM-K", "RAM-J", etc.) and at Volga, on the Crimean peninsula, and other facilities on a temporary basis. There has always been the question of why did the US Intel organizations recognize Ramenskoye as the name of the test facility when the Russians have always addressed it as Zhukovskiy. When the facility first opened the town of Ramenskoye was the nearest population center. There was a worker's construction camp, named Zhukovskiy, that eventually grew into a larger town and became the nearest population center and official Russian name for the facility. A replica of a MiG-15 flown by China's People's Liberation Army Air Force (PLAAF) during the Korean War, this 1/72 scale, plastic model features textured surfaces, a detailed cockpit with a clear plastic canopy, wing-mounted fuel tanks, realistic landing gear, and authentic markings. 5" wingspan; arrives ready to display on the included stand. A replica of a MiG-15 flown by the Soviet Air Force from a Chinese airbase during the Korean War, this 1/72 scale, plastic model features textured surfaces, a detailed cockpit with a clear plastic canopy, wing-mounted fuel tanks, realistic landing gear, and authentic markings, including the red nose ring and lightning bolt on the tail. 5" wingspan; includes a display stand. This 1/25 scale kit includes a vacu-formed canopy, flies by a Jetex 50 engine (not included) or catapult rubber, and has a 16" wingspan when completed. Assembly required. a MiG-15bis flown by Major Ivan Petrovich Golyshevskiy of the 351st IAP (the main night fighter unit of the Soviet Air Force during the Korean War), which was stationed at Antung Air Base in Manchuria, China, in 1953, this 1/102 scale, die cast Model Power model features engraved wing panels and simulated control surfaces, a clear plastic canopy, wing-mounted fuel tanks, authentic markings, and more. 4" long; includes a display stand. Egypt bought a handful of MiG-15bis and MiG-17 fighters from Czechoslovakia in 1955 with the sponsorship and support of the USSR. an Egyptian Air Force MiG-15bis flown during the Suez Crisis in October, 1956, this 1/72 scale, die cast Hobby Master model features engraved panel lines, a detailed cockpit with a sliding canopy and a removable pilot figure, optional-position air brakes and landing gear, removable fuel tanks, authentic markings that include Egyptian Air Force roundels, and more. Measures approximately 5" long with a 5" wingspan and includes a display stand. a MiG-15bis flown by the East German Air Force in 1959, this 1/72 scale, die cast Hobby Master model features engraved panel lines, a detailed cockpit with a sliding canopy and a pilot figure, removable fuel tanks, optional-position air brakes and landing gear, authentic markings that include the GDR coat-of-arms on the tail, and more. Measures approximately 5" long with a 5" wingspan and includes a display stand. a MiG-15bis flown by Major Ivan Petrovich Golyshevskiy of the 351st IAP (the main night fighter unit of the Soviet Air Force during the Korean War), which was stationed at Antung Air Base in Manchuria, China, in 1953, this 1/72 scale, die cast Hobby Master model features engraved panel lines, a detailed cockpit with an optional position canopy and a pilot figure, removable fuel tanks, optional position air brakes and landing gear, an authentic camouflage scheme, and more. Measures approximately 6" long with a 5" wingspan and includes a display stand. This set of four easy-to-build, pre-painted, 1/72 scale plastic kits includes a USAFE "Skyblazers" F-84 Thunderjet, a USAF "Thunderbirds" F-16 Fighting Falcon, a VMA-311 "Tomcats" AV-8 Harrier and a People's Republic of China MiG-15, each with textured surfaces, a glazed canopy, retractable landing gear, authentic markings, and a display stand. Minor screw-together assembly required. a MiG-15bis flown by the Chinese People's Liberation Army Air Force in the Korean War, this amazingly detailed, 1/32 scale, plastic kit features a well-equipped cockpit with a clear canopy, a removable rear section and a trolley that allows you to display the Chinese-built WP-5 turbojet engine, realistic landing gear with real rubber tires, a choice of two markings, and more. 12" in length and wingspan; assembly required. A replica of a J-2 (the Chinese designation for the Soviet-produced MiG-15bis single-seat fighter) flown by the Chinese People's Liberation Army Air Force during the Korean War, this 1/72 scale, die cast Hobby Master model features engraved panel lines, a detailed cockpit with a sliding canopy and a removable pilot figure, realistic cannon pods below the nose housing, transparent headlights on the air intake separator, optional-position air brakes and landing gear, removable fuel tanks, an authentic camouflage scheme with PLAAF markings, and more. Measures approximately 5" long with a 5" wingspan and arrives ready to display on the included stand. A replica of a MiG-15bis flown by the Cuban Revolutionary Air Force beginning in 1961, this 1/72 scale, die cast Hobby Master model features engraved panel lines, a detailed cockpit with a sliding canopy and a removable pilot figure, nose-mounted cannons and wing-mounted fuel tanks, optional-position air brakes and landing gear, authentic markings, and more. 5" wingspan; arrives ready to display on the included stand. This 1/72 scale, die cast J-2 (the Chinese designation for the Soviet-produced MiG-15bis single-seat fighter) wears the post-defection markings of the airplane flown by People's Liberation Army Naval Air Force pilot Liu Chengsi when he defected to the Republic of China (Taiwan) in March, 1962! Made by Hobby Master, this model of the famous airplane features engraved panel lines, a detailed cockpit with a sliding canopy and a removable pilot figure, realistic cannon pods below the nose housing, transparent headlights on the air intake separator, optional-position air brakes and landing gear, removable fuel tanks, authentic Republic of China (Taiwan) Air Force markings (painted on the aircraft after the defection), and more. Measures approximately 5" long with a 5" wingspan and includes a display stand. Handmade of Philippine mahogany, this 1/32 scale model measures 12" in length and 12" in wingspan, is hand painted and detailed, and arrives ready to display on the included mahogany base. Krylov & Tepsurkaev. Through detailed unit histories and rare firsthand accounts, this heavily illustrated book uncovers Soviet aerial combat experiences during the Korean War, from the training of Chinese pilots by Soviet Air Force regiments in 1950 through the Soviets' success over MiG Alley, where more than 25 of them achieved ace status flying the MiG-15. 96 pages, 73 B&W photographs and 36 color aircraft profiles, 7"x 9", softcover. Featuring incredible footage of aerial combat, this program examines the Korean War dogfights between the Soviet-built MiG-15 and the American F-86 Sabre over North Korea's MiG Alley in what were the world's first large-scale jet-vs.-jet air battles. 30 minutes. This DVD includes nine stunning programs that tell the story of the jet fighter's development after World War II. It takes you through the early days of the Korean War, when air power alone kept the North Koreans from driving UN forces into the sea; examines the strengths and weaknesses of the MiG-15 and the F-86; and describes the day-to-day heroics of the young pilots who supported Allied troops on the ground. You even hear commentary from legendary fighter pilot and former Air Force Chief of Staff Gen. Merrill (Tony) McPeak! 1 hour. Stapfer. Though one fell victim to an American F-80 in history's first all-jet aerial combat over Korea in late 1950, the MiG-15 was superior to any fighter plane in the American inventory. Here, you'll get a full tour of the innovative Soviet design through hundreds of photographs - half of which are in color - of fully restored examples, including up-close views of the plane's systems, jet engine, cockpit, and more. 80 pages, color profiles, 11"x 8", softcover. Davis. The F-86 Sabre was the western world's premier fighter aircraft during the early 1950s. Over 800 MiG pilots in Korea discovered firsthand about the superiority of the F-86. But the real story begins during the waning years of WWII, when the Luftwaffe's Me 262 dooms the future of propeller-driven aircraft. Here is a wonderful photographic record of that story, from development beginning in 1945 through service in the 1950s. 79 pgs., 180 color and B&W photos, 15 color profiles, color artwork, 3-views and more. 11"x 8". Foster & Vaughan. The author joined the Army Air Force in 1943 and retired in 1975 as a lieutenant colonel. This book recounts his Korean War experience where he was one of the highest-scoring aces. His record of nine MiGs destroyed places him twelfth on a list of 38 aces. All of his scores came in "MiG Alley," between North Korea and China. Revisit this dramatic front with one of its finest pilots. 152 pages, B&W photographs, 5"x 8", softcover. Mikoyan MiG-15, Gordon & Komissarov. This lavishly illustrated book examines the design, development and service of the rugged Mikoyan-Gurevich MiG-15, which, introduced in 1947, saw its first combat in the Korean War and ultimately became the most widely produced jet fighter in history with more than 12,000 built. 432 pages, 1,000 B&W and color photographs, 100 profiles and line drawings, 8"x 11", hardcover. , Kum-Sok. On September 21, 1953, 21-year-old North Korean Air Force officer No Kum-Sok landed a MiG-15 - the most advanced Soviet-built fighter of the era - at Kimpo Air Base near Seoul, Korea. This memoir provides unique insight into how North Korea conducted the Korean War and how Kum-Sok came to the decision to leave his homeland. 232 pages, B&W photographs, 5"x 9", softcover. Boniface. Filled with rare firsthand accounts from North Vietnamese pilots and details on fighter operations against the U.S., including the "Black Friday Massacre" (the U.S.'s largest aerial defeat of the war), this heavily illustrated book examines the operations of the Vietnamese People's Air Force during the Vietnam War. 256 pages, 195 B&W photographs and 5 maps, 6"x 9", softcover. Davies. This book examines the top-secret Cold War program in which the U.S. Air Force acquired and flew Russian-made MiGs to expose more than 1,600 American fighter pilots to the enemy aircraft's capabilities. You'll learn of the difficult task of acquiring MiGs and making them airworthy without manuals or parts, of the secret squadron stationed at a remote Nevada airfield, of the ace pilots who trained to fly the MiGs, and more. 352 pages, 32 pages of color photographs, 6"x 9", hardcover. Boniface. Through firsthand accounts from leading Vietnamese People's Air Force pilots (including Nguyen Van Coc, the highest-scoring ace of the Vietnam War) that challenge previous U.S. military documents, this heavily illustrated book examines VPAF fighter tactics, operations, and key engagements against U.S. Air Force F-4s, F-105s, F-8s and B-52s over North Vietnam between 1965 and '75, including the Black Friday Massacre (America's heaviest aerial defeat). Includes 24 profiles of rare VPAF aircraft, including the Soviet-supplied MiG-15 and MiG-17F and the Chinese MiG-19 (Shenyang F-6). 176 pages, 150 B&W photographs and color profiles, 9"x 12", hardcover. Sabres vs. MiGs over Korea: Pilot Accounts and the Complete Combat Record of the F-86 Sabre, 1950-53. Thompson & McLaren. Filled with firsthand accounts from pilots who flew the F-86 over Korea, this lavishly illustrated volume includes an aircraft-by-aircraft record of every F-86 that flew during the war, a complete listing of confirmed kills by Sabres, a roster of Korean War aces, and much more. 288 pages, 225 color and 52 B&W photographs and illustrations, 11"x 10", hardcover. Larry Davis. This pictorial review of the Korean air war shows them all: F-51 Mustangs and F4U Corsairs, the new jets like the F-80, F-84, F-86 and T-33, even the attack aircraft and bombers such as the B-26 and B-29 are here. If you want to see the aircraft of Korea, this is the book for you! Includes 140 B&W photos, 36 color profiles, maps, squadron markings and more. 80 pgs., 8"x 11", sfbd. One of the most numerous jet aircraft with more than 12,000 built, the Mikoyan-Gurevich MiG-15 achieved its fame in the skies over Korea. 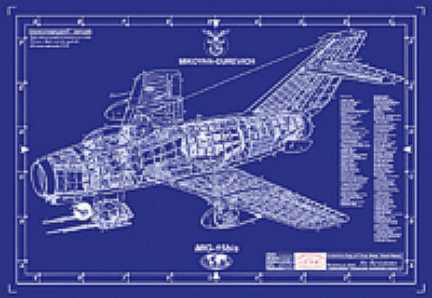 Created by professionals who have painstakingly recreated and modified vintage drawings, this real blueprint - made directly from a vellum master - of the MiG-15 Fagot gives you an inside look at the revolutionary design of one of the first successful swept-wing jet fighters.